First up, the dorkiest and most entertaining superhero movie to come along in a while. Somehow, yes, it’s AQUAMAN (@ BLU), a movie that has Willem Dafoe riding a seahorse and an octopus that plays the drums. Barry Jenkins followed up his Best Picture-winning MOONLIGHT with IF BEALE STREET COULD TALK (@ BLU), an adaptation of the novel by James Baldwin that elegantly captures his unique voice. And legendary animator Satoshi Kon’s seminal giallo-inflected anime thriller PERFECT BLUE (@ BLU) is celebrating its 20th anniversary. 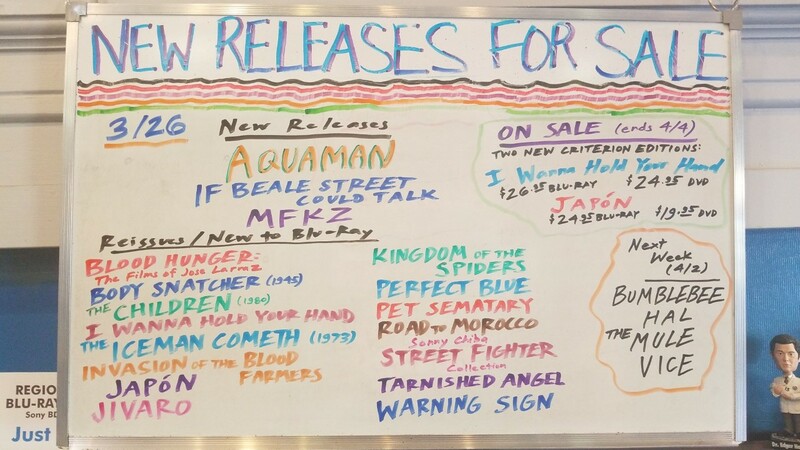 Check out the big board for everything else we got in for sale this week!